I’m a Korean guy in my late 20s. Like my dear father, I like fine cognac, mountain climbing (especially the sacred Mount Baekdu), and riding white horses. Like my dear father, one of my hobbies is looking at things: looking at miniature airplanes, looking at buttons, looking at breakfast, looking at musicians, looking at coffee tables, looking at pictures of my dear father. I’m looking for an 18-25 year-old Korean woman to share my future with. You will like wearing 80s disco fashion, standing to attention in the background while my people adore me, and admiring pictures of my dear father looking at things. The South Korean dating website Couple.net decided to run Kim Jong-un’s statistics through their database to find his perfect match in time for White Day. The company claims to have matched 23,000 people over the past 20 years using Korea-specific criteria such as job and education (especially which university), families’ assets, your parents’ education level, military service, religion, and appearance. Under the appearance category we have the usual height/weight and an attractiveness self-assessment. One wonders how many choose ‘least attractive’. Previously, the company’s non-global site Sunoo.net made the Korea Times ‘news’ because for the first time they allowed a non-Korean to post a profile on their website; she was a young Finnish woman looking for a Korean husband. Last year following the World Cup, they arranged for Paraguayan bikini model Larissa Riquelme to come to Korea and date several Korean men they selected using their exclusive algorithm, The Logic. Now that White Day has passed, we can look forward to Black Day on April 14. 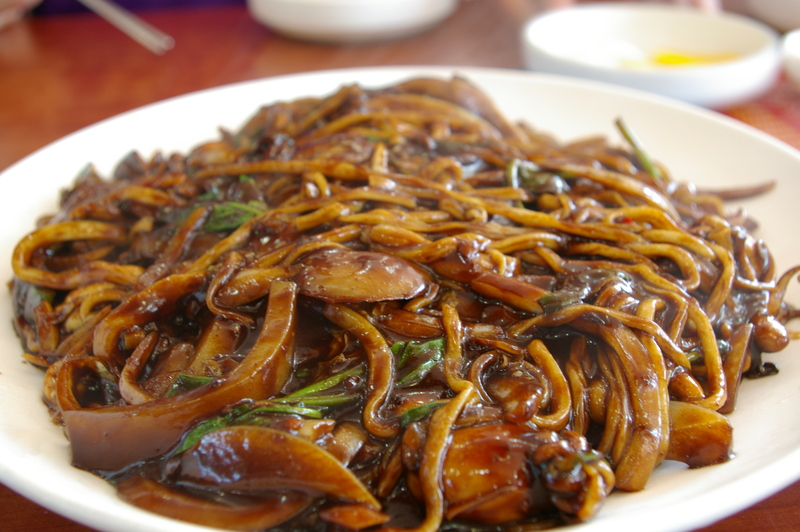 Black Day, as you’ll know from last month, is when singles gather to eat jajangmyeon and generally feel sorry for themselves. As part of a nationwide outreach programme, we at FLiK would like to help you navigate the potential minefield of the Korean dating scene. If you want to do it the right way, you could pay any one of 1000 similar companies for matches, dates and personal consultations with a professional matchmaker. Prices average about $100 a date so if you’d rather spend that money on something else, you could simply ask your friends and coworkers to arrange dates for you. Blind dates are hugely popular in Korea and don’t have the same stigma normally reserved for them elsewhere. Some people regard it as their sacred duty to set up blind dates for their coworkers so often times the first question asked of you when you arrive at the office for the first time will be whether you are single or not. Answer in the affirmative and you will almost certainly be asked “Do you want a blind date?” (seogaeting) In a few days your coworker will have diligently searched through their contacts and whittled the list down to the most suitable for you based on your strict criteria. From there, it’s up to you. Don’t feel too bad if you luck out though; apparently it happens pretty often. If going solo is a little daunting, you can try the group version, miting (미팅, meeting). For this, four men and four women meet in a café or sul-jib (술집, Korean-style bar) and play a few selection games. One game has participants choosing an avatar and placing it in the middle of the table (protip: Rolex watches work awesome!). Once all avatars are placed, the ladies choose the one representing the man they like. Another game is called sarangi jakdaegi (사랑의 작대기, love pointer). In this one you point to the guy/girl you like. If your target points to you as well, then great! If not, then maybe someone else will point at you. If that doesn’t happen then there is always a nice bowl of steaming jajangmyeon waiting for you. AJ would be so jealous of that plate of jajangmyeon! We saw that you left Facebook and just wanted to see how things are going. Not much has changed for us, still livin’ the dream in the Midwest. Take care!